Enroute : The Driving Lenses that take you places. For many people, driving is one of the most important activities in their daily lives. However, as roads become more congested and we spend an increasing amount of time behind the wheel, it can be our eyes that end up taking the strain. Impaired vision also has a dramatic impact on reaction times so your road safety could also be affected. Designed with drivers in mind, EnRoute is the driving lens that meets the visual demands of today’s drivers. Equipped with a specially developed glare filter, they specifically cut light from the blue end of the visual spectrum – reducing light scatter and distracting glare from the dashboard, streetlights and LED & Xenon headlights of oncoming traffic. At the same time, they enhance the transmission of necessary light, improving contrast and brightness perception – even in poor light and bad weather. This results in more comfortable, relaxed vision even in stressful driving situations. EnRoute lenses are available in both single vision and varifocal designs. 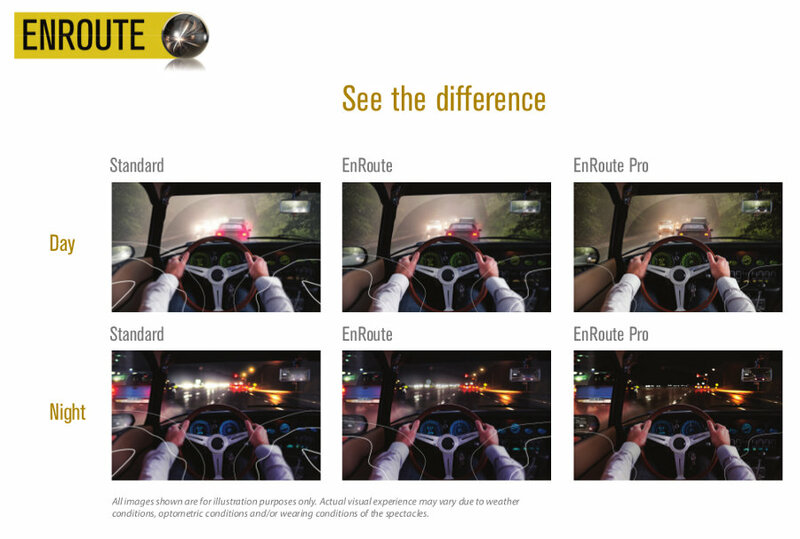 There is also an EnRoute Pro driving lens available, featuring a further contrast enhancing filter. Designed with professional drivers in mind, the lenses will also be beneficial for anyone who does a significant amount of night-time driving. To find out more about the EnRoute driving lenses, visit hoya.co.uk. Or ask any member of staff during your next eye examination.